Heraclius 610-641. 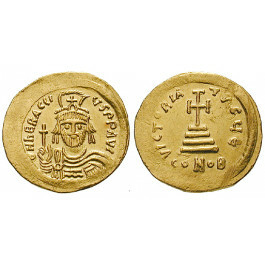 Solidus 21 mm 610-613 Constantinople. Draped and cuirassed bust facing, wearing plumed helmet decorated with a cross and holding globus cruciger in r. hand / Cross potent on three steps; Officina E. Sear 731; GOLD, scratch on rev.